Ho Chi Minh City was our first stop in Vietnam and our entry point into South East Asia. Neither of us had been to Vietnam and were unsure what to expect. Once we got past the madness of the motorbikes, the constant beeping of horns and learned how to cross the road HCMC turned out to be a surprisingly pleasant place. On reflection, this was one of places we enjoyed most in Vietnam. In the end we ended up staying in HCMC on 3 seperate occasions which gave us a lot of time to explore the place. It was not our intention to be in HCMC so often but it just worked out that way when transferring to different places. Each time we stayed in District 1 just outside of the main backpacker area. District 1 is the most central location and is walking distance to most things you will want to see and do. 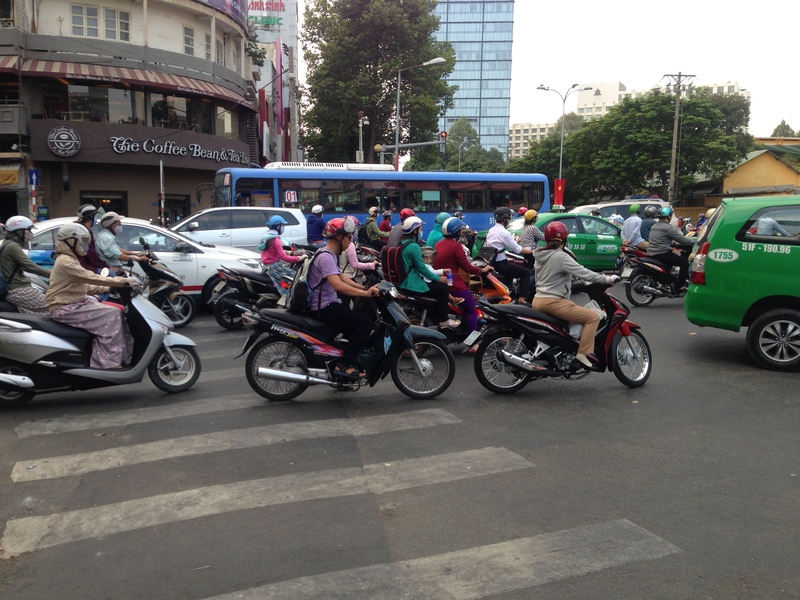 One of the first things that becomes apparent is how many motorbikes there are in HCMC. Most of the time it is a never ending swarm of bikes thundering along the main avenues making crossing the road somewhat of a challenge. Crossing the road involves doing what you are told not to do elsewhere – step out into the traffic. Yes scary at first but after a few attempts we got the hang of it. The thing to remember is to not walk backwards and keeping moving at a steady pace, no sudden moves! The bikes will move around you but they will get pretty close to you. You just need to learn to step out. On our first day in the city we did very little due to jet lag but once we recovered we set off to explore the city. We started with a general wonder around to see what the city had to offer beyond the backpacker area. Right in the middle of town is the main market of Cho Ben Thanh Market. It sells most things from food to clothes to sunglasses and watches. Behind the Market is a night food market which is worth going too as it offered a range of cheap eats from various parts of Asia even if it is a bit touristy. Cho Ben Thanh Market before the traffic picks up! If you still want to keep shopping the head along to Saigon Square on Le Loi Street. As Vietnam is the sweatshop of the world when it comes to clothes Saigon Square is the place to go to get a bargain. Be prepared to haggle to get a good price. The general rule we found is to half their first price then go up another half if needed. If in doubt walkaway, if they follow you then you have won, if not then you have gone too low. Don’t worry, most places sell the same things so you can try your luck elsewhere. If you are into architecture then its worth going to the Revolution Palace. This was the Palace for the President of Southern Vietnam before reunification. The place has been maintained and keep how it was at the time of use. As I love architecture I really enjoyed visiting the Palace. One of the most interesting but harrowing places to visit in HCMC is the War Museum. It explains the horrors of the war from Vietnams point of view with the Americans being painted in a very negative light. The museum discusses the use of agent orange and provides graphic details of the aftermath. If you have time it is worth doing the day trip to the Cu Chi Tunnels north of the city. Most hostels will offer this tour for about d80,000-d120,000. Once at the Cu Chi you will spend the first 20 minutes watching a video on the purpose of the tunnels and how they were dug. After a visit to the see the traps set up in Cu Chi you get the chance to walk in the tunnels. If you are tall or do not light small spaces this might be the part to skip but there are exit points every 30m if you want to give it a go. One of the best colonel buildings in the city is the Notre-Dame Cathedral. The Cathedral built by the French sits in the middle of a small square adjacent to the historic Post Office (also worth a look). It does seem that the Cathedral is closed most of the time so you are unlike to see inside. The Cathedral and Post Office are both located at Cong Xa Paris. Like most cities HCMC has a huge range of food choices from traditional Vietnamese to more western food. No matter where you go you can get cheap food. There are countless restaurants set up on the street of little hole in the wall restaurants. Generally you can get dinner for a few dollars. We tried a range of different places all over town and had no real complaints. One of the main dishes to try is Phở which is a Vietnamese rice noodle soup usually served with chicken (ga) or beef (bò) and comes with fresh herbs, lime and mung beans. One soup Katie ordered came with livers and kidneys so be careful! We did make serval visits to The Kafe which offered good coffee and a range of western and modern vietnamese dishes. It is not the cheapest option but did provide some home comforts and a break from more traditional food. One of the things we loved about Vietnam is the coffee. It is strong so if you really want to enjoy it you need to drink it like a local. Locals drink the coffee with ice and condensed milk. If you try to drink it black it will be extremely bitter. Prices vary across Vietnam, sometimes it’s d50,000 and sometimes it’s d3,000 but generally it tastes the same, good! If Vietnamese coffee is not for you, there are plenty of coffee shops in town offering expresso. We particularly like SNOB Coffee, yum coffee and cold air-conditioning! Traditional Vietnamese coffee served with ice and condensed milk. In and around the backpacker area you will find a many bars aimed at tourists and they are all pretty similar. The city has a number of rooftop bars available but the prices of drinks seemed to triple and you are paying more western prices. If you are on a budget stick of backpacker bars or local bars but if you want great views of the city checkout one of the rooftop bars. It might also pay to dress up a bit when going as they were pretty trendy! We did find one bar called Vinyl Bar on 70 Pasteur Street that had endless beer for 3 hours during happy hour for d100,000 Dong. Not that we are encouraging heavy drinking but it is a good offer if you like a lot of beer. They weren’t afraid to keep bringing it either, they seem to think when you have half a beer you are ready for another! This is not a breakfast! Recently HCMC has started a new limited stop airport bus that runs from outside the International Terminal to District 1. Bus number 109 started earlier this year and is cheap, frequent and yellow so you cant miss it. The bus travels between Cho Thai Binh and the airport via Cho Ben Thanh bus station (downtown). We used it once form the city to the airport and had no problems. We did however get a taxi when we first arrived. As you exit customs there is a number of taxi company desks which will arrange a taxi for you. It is a fixed fee but it is generally recommended as you are going to end up in a legit taxi. Drink Vietnamese coffee just like a local – with ice and condensed milk! Coming from Central America HCMC was a change of pace for us which took some getting use to. After struggling at first we slowly got into the swing of things and started to enjoy the city more. Overall, we really like HCMC and found it a much easier and enjoyable place than Vietnams other large city Hanoi.